The following links lead to (heavily) illustrated descriptions of the twelve ZNKR seitei Iai kata. 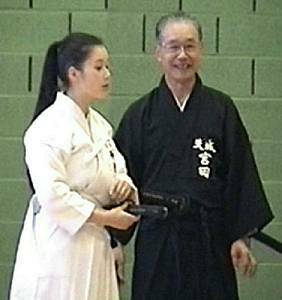 The illustrations are from a demonstration by Miyata Tadayuki sensei, Iaido 8-dan Kyoshi, Kendo 7-dan Kyoshi, during the 8th European Iaido Championships - November 2001 in Brussels. The explanations are a transcription of Kishimoto sensei's words as translated at this event. Naturally a lot more can be said about these forms. This illustrated kata description is for the purpose of information and a possible memory aid to people starting out in the ZNKR Iai kata. It is not intended to teach the forms described.